Liquid crystal is a curious phase of matter. It has the ability at once to flow, like water, and to refract, like ice. It was closely observed, if not yet named, by experts in 1888 but they found no practical use for it. Probed and imaged for decades, its polar properties were eventually harnessed for an age of screen-based media. Now liquid crystal is ubiquitous, communicating, selling and delighting, in flat-screen LCDs, computers and mobile devices. We also now know that it exists inside our bodies. For the very first time, Liquid Crystals tells the history of this anomalous and little understood phase of matter in relation to a ‘liquid crystal’ epoch, spanning from 1820 to today, detailing the key interminglings of the liquid and crystalline located in politics, philosophy and art during this time. There are insightful and remarkable readings of cultural forms from Romantic landscape painting to snow globes, from mountain films to Hollywood eco-disaster movies, from touchscreen devices to DNA, cold wars and political thaws, media meltdowns and ice in the desert. 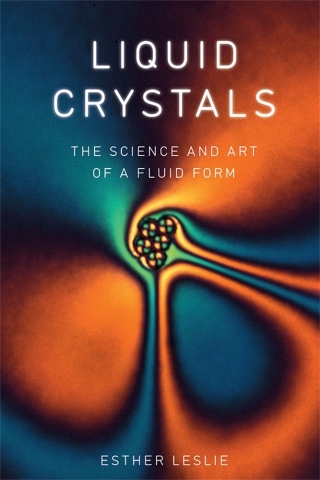 Expertly written in an accessible style, Liquid Crystals recounts the unheralded but hugely significant emergence and applications of this unique matter. Esther Leslie is Professor of Political Aesthetics in the School of English and Humanities at Birkbeck, University of London. She is the author of Walter Benjamin: Overpowering Conformism (2000), Hollywood Flatlands: Critical Theory, Animation and the Avant-garde (2002) Synthetic Worlds: Nature, Art and the Chemical Industry (Reaktion, 2005), and the editor and translator of On Photography by Walter Benjamin (Reaktion, 2015).